Looking for thrills in a safe setting outdoors? Then try the EVEILS sailing school at Fort-Mahon! All together, you can combine fun and learning on a Dart 16 as you sail with the wind in this wonderful setting. If your children are too young you can always try the large lake at Belle Dune. Here children aged 7 and over can try their hand at sailing. Bonus: there's also stand-up paddling, a slower alternative to wind surfing! Hoist the sails with your friends at EVEILS! Thrill seekers, beginners or experienced sailors - all are welcome. 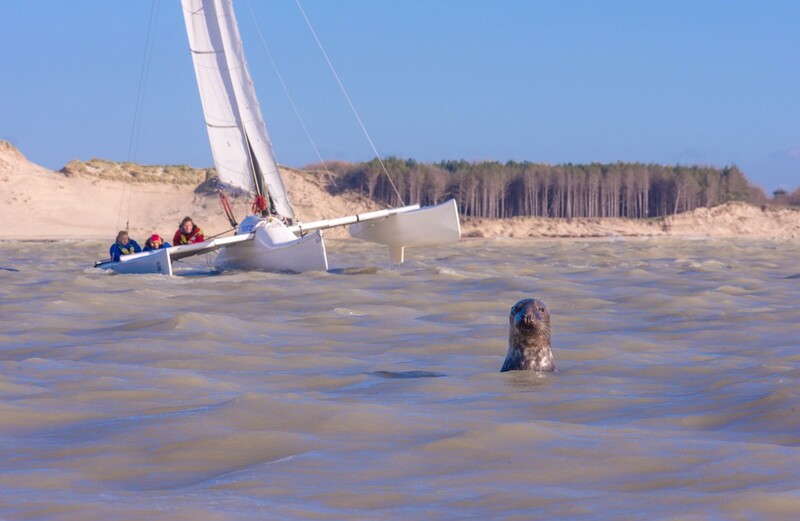 Aboard a Dart 16, a safe yet racy dinghy, you can sail in the Baie with its seals, enjoying the feeling of freedom and the wind in your hair... For even greater thrills, try the Tricat 22 and try to beat its speed record! UNFORGETTABLE! Catamaran and trimaran sailing. Discovery trails along the coastline for adults and children. Water garden: a catamaran in an indoor pool (for ages 7 and up). Beginner and improver courses). Equipment available (kayak, catamaran). Regatta organisation. Boat storage.